The flood-plain lakes are biologically interesting ecotones that are considered to be the most important and productive ecosystem (Mitsch and Gosselink, 1986). These are a source of renewable resources, such as need for construction, fish for human consumption and pasture for grazing livestock. Assam is gifted with many extensive water bodies locally known as beels that are the only source of fish for the poor people in the surrounding village (Jhingran and Pathak, 1987). The fish diversity in the flood plain of Brahmaputra basin are found to be numerous but there has been rapidly dwindling due to the habitat destruction, over exploitation, siltation, pollution and use of destructive fishing methods. The Dulakhojiya beel harbours wide varieties of fish fauna and had been remain as the center for the livelihood of local fisherman. The previous studies reported that a considerable variation in number of fish species available in different beels of Assam. There are some notable works on the hydrobiology and fisheries of wetlands (Jhingran, 1991; Goswami et al. 1999; Bhuyan et al. 2009; Kalita et al. 2011; Chakravatty et al. 2012;). 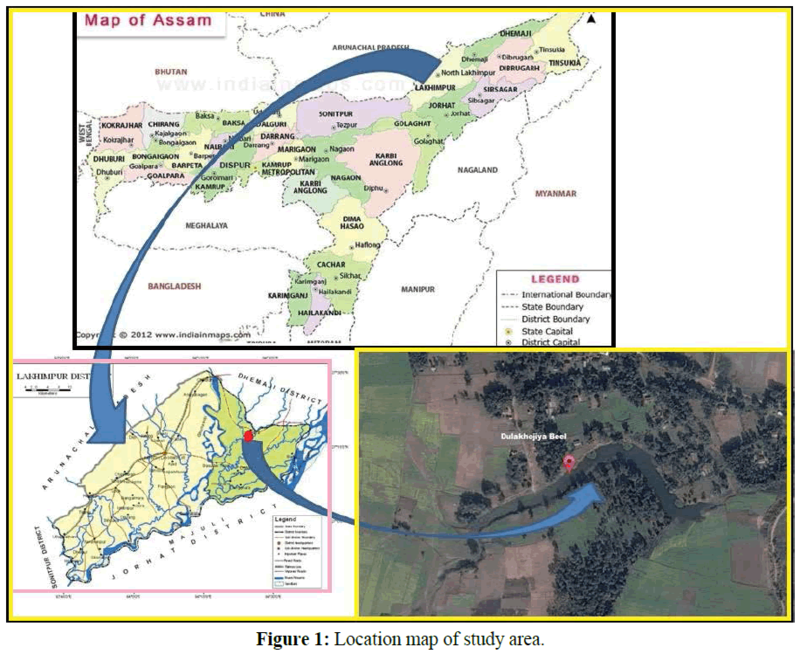 Investigated on the limnology, fish diversity and including its bearing production of Maijan beel of upper Assam was reported by Singh et al. 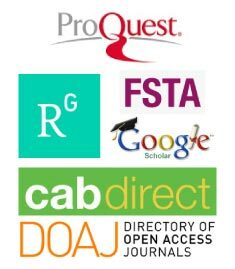 (2009) and Dakua et al. (2009). Again, Abujam et al. (2012a and 2012b) listed faunal diversity and ecological status of Maijan beel and Botalikhosa wetland in upper Assam. However, there is no information or documented on such aspects from this wetland. Therefore, an endeavor had taken to prepare a checklist of available fish fauna of Dulakhojiya beel which will serve as baseline data for conservation and management of the fishery resources. The Dulakhojiya beel (wetland) is located in and around the village Parghat of Lakhimpur district, Assam, India. The total area of the Dulakhojiya beel is about 142 Bigha (Figure 1). The geographical location of the beel lies between latitude 27°16' N and longitude 94º24' E. The beel is flooded by the tributaries of Brahmaputra River during summer. The wetland is surrounded by Korha river in east, by Markathoni Gaon in west; by Parghat and Deudubi Gaon in North and by Sakuli Gaon (Bolahi) in South. Figure 1: Location map of study area. Fish samples were collected randomly from different landing sites of the beel during March, 2015 to February, 2016. Fishes caught alive or in fresh condition had been preserved in 5% formalin solution for further study. They were identified with the help of standard keys of Talwar and Jhingran (1991) and Vishwanath et al. (2007). The status of the recorded fish species were also evaluated based on the IUCN (2015-4). A total of 75 species belonging to 49 genera and 23 families were recorded from Dulakhojiya beel (Table 1). Cyprinidae was found to be most dominance among the families with 27 species and followed by Bagridae (7 species); Cobitidae (6 species); Channidae (4 species); Siliridae, Schilbeidae and Osphronemidae with 3 species each. The family Mastacembelidae, Nemacheilidae, Clariidae, Badidae, Notopteridae and Ambassidae were represented by 2 species each while the family Tetraodontidae, Synbranchidae, Heteropneustidae, Belonidae, Nandidae, Clupeidae, Gobiidae, Anabantidae, Sisoridae and Chacidae were represented by a single species. Genus composition revealed that the Cyprinidae have 15 genus followed by Cobitidae and Bagridae with 4 each while Schilbeidae with 3. 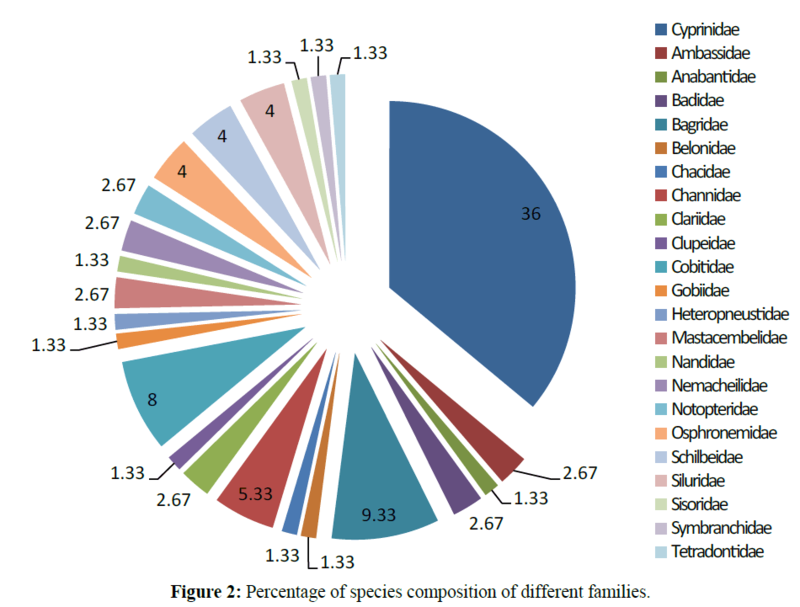 As far as the species composition is concerned, the Cyprinidae was 30.0% followed by Bagridae (9.33%), Cobitidae (8.0%), Channidae (5.33%), Siluridae, Schilbeidae and Osphronemidae (4.0%) whereas rest of the families accounting with 2.66% and 1.33% each (Figure 2). Table 1: Checklist of fish species documented in Dulakhojiya beel. Figure 2: Percentage of species composition of different families. Generally, the Cyprinidae was most dominant family followed by Bagridae and Cobitidae of beel fisheries of Assam in terms of edible and ornamental fish species (Dey, 1981, Yadava, 1987, Singh et al. 2009, Abujam et al. 2012). In present study, Labeo gonius, Labeo rohita and Cirrhinus mrigal were abundant species among the Indian major carp (Plate 1). Among the catfish Wallago attu were the relatively dominant species while, among the murrels, Channa marulius was rarely found and C. punctata is one of the most abundant fishes. If the extraction persist, it is quite possible that the C. marulius would be extinct in coming years. Out of the two feather backs, N. notopterus was moderately found while N. chitala was rare. The perches such as A. testudineus, T. fasciata, T. lalius were found to be dominant species while, among the eels, the most important large species M. armatus, M. cuchia were rare. The fish species such as M. bleekeri, M. tengara, N. nandus, L. bata, X. cancila were abundant species. The weed fish species such as C. nama, P. gelius, P. sarana, P. sophore, P. ticto, N. atherinoides and A. mola were dominantly found species. In terms of ichthyo-faunal diversity and species composition, the similar observation was found in different beels of Assam (Singh et al. 2009; Kalita et al. 2011; Abujam et al. 2012; Chakravartty et al. 2012). Plate 1: Some edible and ornamental fish species from Dulakhojiya beel. As per IUCN-2015 (Table 1), a number of 55 species were found under least concerned (LC), 7 species were near threatened (NT), 2 species were vulnerable (VU), 4 species were data deficient (DD), 1 species as endangered (EN) and 6 species under not evaluated (NE). The species like Aborichthys sp., Lepidocephalichthys sp., Badis assamensis and Anabas testudineus were found under data deficient category. The species under vulnerable were Cirrhinus mrigala and Botia rostrata while, Labeo nandina, Hypophthalmichthys molitrix, Ompok bimaculatus, Ompok pabo, Wallago attu, Notopterus chitala and Ailia coila were listed in near threatened. Some of the species namely Puntius gelius, Danio devario, Mastacembelus armatus, Clarius batrachus, Somileptes gongota and Tetraodon cutcutia were listed under not evaluated category. Clarias magur is the only species which was falls in the endangered category. Among these species, Notopterus chitala, Clarius batrachus, Ompok pabda, Ompok pabo, Ompok bimaculatus, Monopterus cuchia and Heteropneustes fossilis are highly priced fishes. From the above investigation, it is clear that Dulakhojia beel (wetland) having a good number of fish species. The occurrence of the endemic, endangered, and near threatened species assumes the importance of beel in terms of conservation. The conservation of the important ornamental and edible species through various strategies is the need of the hour for future for generating income to the nearby dweller. Excessive growth of macrophytes should be controlled in order to prevent from the silting of the beel. Sustainable exploitation and breeding of native ornamental fish species in the beel should be taken up. Abujam, S.K.S., Paswan, G., Dakua, S., Saikia, A. K. (2012a) Faunal diversity and ecological status of Maijanbeel (Wetland).Fishing Chimes32,43-48. Abujam, S.K.S., Paswan, G., Dey, M., Biswas, S. P. (2012b) Water quality and fish diversity of Botalikhosa wetland with reference to socio-economic status. J Fish Eco and Develop 13, 29-39. Bhuyan, K. C., Dutta, A., Kalita, B. (2009) Hydrobiology and Fishery status of Sondobabeel, Morigaon, Assam. J Inland FishSoc India41, 48-53. Chakravartty, P., Chakravartty, M., Sharma, S. (2012) A Survey on the Fish Diversity with Special Reference to the Classified Ornamental Fishes and their Prospects in the KaplaBeel of Barpeta District.The Science Probe1 and 2, 12-21. Dakua, S., Singh, A.S.K., Choudhury, P., Biswas, S. P. (2009) A preliminary investigation on the fish & fisheries of Maijanbeel in upper Assam. Indian J. Environ and Ecopl 16, 263-270. Dey, S.C. (1981) Studies on the hydrobiological conditions of some commercially important lake (beels) of Kamrup district of Assam and their bearing on fish production, Final Tech. Report.North Eastern Council, Guwahati, India. Goswami, M.M., Deka, M., Singh, T.K., Sarma, P.K., Kakati, M. (1999) Studies on some wetlands of Assam with reference to the eutrophication stress. J Inland Fish SocIndia31,39-43. IUCN. (2015-4) IUCN Red List of Threatened Species. Jhingram, A.G., Pathak, V. (1987)Ecology and Management of beels in Assam-A case study of Dhirbeel.Workshop. Dev. Beel Fisheries, Assam, Assam Agricultural University, Khanapara, Assam p: 16-28. Jhingran, V.G. (1991) Fish and Fisheries of India.Biological investigation in Assam beels. 3rd Ed, Hindustan Publishing Corporation (India)p: 214-220. Kalita, J.C., Deka, U.S., Haque, A., Kalita, T.C. and Deka, S. (2011) Assessment of fish-biodiversity of KoyaKujiyabeel, Abhayapuri, Assam in relation to certain physicochemical and anthropogenic factors. The Bioscan6, 425-431. Mitsch, W.J., Gosselink, J.G. (1986) Wetlands. Van Nostrand Reinhold. New Workp: 539. Singh, A.S.K., Dakua, S., Biswas, S.P. (2009)Physico-chemical parameters and fish enumeration of Maijanbeel (wetland) of upper Assam.Geobios36,184-188. Talwar, P.K., Jhingran, A.G. (1991) Inland Fishes of India and Adjacent Countries. A.A. Balkema, Rotterdam 1,541. Vishwanath, W., Lakra, W.S., Sarkar, U.K. (2007)Fishes of Northeast India. NBFGR, Lucknow, U.P, Indiapp: 264. Yadava, Y.S. (1987) Studies on the ecology of an ox-bow lake in context to the development of beels in Assam.In Compendium of Work-shop on Development of Beel Fishery in Assam. Assam Agricultural University, Khanapara, Guwahatipp: 70-88.